Located in Las Vegas (Las Vegas Strip), Bellagio is a 4-minute walk from Bellagio Conservatory & Botanical Gardens and 14 minutes by foot from Park Theater. This 5-star resort is 1.1 mi (1.7 km) from T-Mobile Arena and 3.2 mi (5.1 km) from Las Vegas Convention Center. The Bellagio offers multiple non-gaming facilities. With a design based on Zen philosophy, the 65,000-square-foot Spa & Salon at Bellagio (surcharge) features travertine marble, granite, bleached walnut, onyx, reflecting pools, water walls, and illuminated aqua-colored glass. The spa has 54 treatment rooms, men's and women's saunas, steam rooms, and spa tubs of varying temperatures. A fitness center offers yoga, Pilates, and spinning classes. Via Bellagio hosts such luxury boutiques as Prada, Chanel, Dior, Gucci, and Hermès. An ornate vault of glass and green wrought iron, the Conservatory shelters a seasonal flower garden. A Mediterranean garden with fruit trees houses five heated pools, three with oversize fountains. A business center provides high-speed Internet access, printing, faxing, copying, shipping, and other services (surcharges). Spago by Wolfgang Puck - Wolfgang Puck’s re-imagined Spago combines warm, chic design, and stunning views of the Fountains of Bellagio to create an iconic new location for the chef’s legendary, flagship restaurant. Enjoy California fare with market-driven menus featuring handmade pastas, wood-oven pizzas, fresh seafood, all-natural meats, prime steaks, handcrafted cocktails, as well as a robust wine list and dessert complements. Picasso - Lakeside, fountain-view restaurant. Featuring original Picasso oil paintings and ceramics. Chef Julian Serrano offers French-Mediterranean cuisine. Open Wednesday–Monday. Dinner only. Prime Steakhouse - Renowned chef Jean-Georges Vongerichten's lakeside, fountain-view steakhouse with 1930s-style speakeasy decor. Dinner only. Le Cirque - Outpost of famed New York City French restaurant with intimate, jewel-box dining room under a draped-silk ceiling. Dinner only. Closed Monday. Michael Mina - Namesake, seafood restaurant of celebrated chef. California and Mediterranean ingredients. Dinner only. Closed Wednesday. Lago by Julian Serrano - Italian small plates, Bellagio fountain views, and exquisite decor. Yellowtail Sushi Restaurant & Bar - Traditional and modern Japanese cuisine. Patio overlooks the hotel's lake and fountains. Open daily from early evening. Jasmine - Chef Philip Lo's contemporary Hong Kong cuisine. Lake and garden views. Dinner only. FIX - Classic American fare in dining room constructed almost entirely of Costa Rican padouk wood. Dinner and late-night dining. Harvest - Health-conscious, market-inspired menu featuring fresh, creative dishes. Open daily for dinner. Noodles - Pan-Asian noodle dishes and Hong Kong barbecue. Lunch, dinner, and late-night dining. Dim Sum Friday for brunch. The Buffet - Breakfast, lunch, and dinner buffets and weekend champagne brunch. Bellagio Patisserie - European-style pastries, desserts, gelato, sandwiches, salads, crepes, espresso, and one of the world's largest chocolate fountains. Open from early morning to late night. Petrossian Bar - A 24-hour wine bar serving Petrossian caviar, smoked salmon, champagne by the glass, and cigars. Palio - Soups, sandwiches, light fare, and coffee. Pool-view tables. Open from early morning to late night. Café Gelato - Italian ice creams, smoothies, and pastries. Open from early morning to late night. The Pool Café - Seasonal outdoor café. Breakfast and lunch. Pool Bar - Seasonal outdoor bar. Open from early morning to late evening. Snacks - Fast-food spot in casino. Sandwiches and snack foods. Open from midmorning to late night. Baccarat Bar - A 24-hour lounge with piano music. The 89,000-square-foot casino includes a poker room, a plush high-limit room, video poker, slots, table games, and a race and sports book. Displays by the Fountains at Bellagio attract thousands of sightseers. 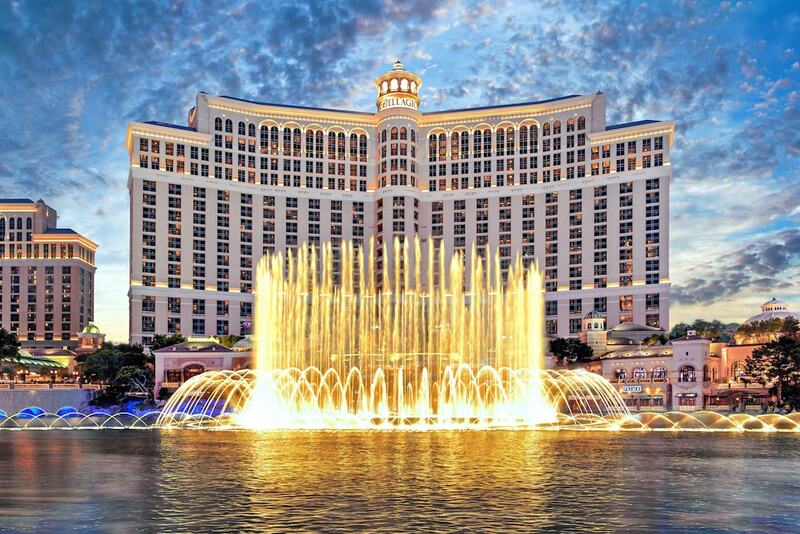 Located in eight-acre Lake Bellagio fronting the hotel, the lighted fountains erupt, sway, and dance to music ranging from Sinatra to Pavarotti. Employing a stage rising from and falling into a 1.5-million-gallon pool, Cirque du Soleil presents the cycle-of-life show O (surcharge). The opulent nightclub The Bank offers DJ music Thursday–Sunday. Hyde is an indoor-outdoor nightclub with a terrace that overlook's the famed Fountains of Bellagio. The Bellagio Gallery of Fine Art is Las Vegas' premier exhibition space, committed to presenting intimate exhibitions featuring works by some of the world's most compelling artists. Organized in partnership with museums and foundations from around the world. A 9.5-acre Mediterranean garden with fruit trees and slender cypresses includes five heated pools, three with oversize fountains. The two largest pools, 180 feet and 150 feet long, are open year-round. The garden also houses four spacious spa tubs, sundecks, and rental cabanas with TVs, phones, refrigerators, sinks, dining sets, padded lounges, ceiling fans, and misting systems. The Spa & Salon at Bellagio (surcharge) features a 6,000-square-foot fitness center with plasma TVs, cardio and weight machines, and free weights. Fitness classes such as yoga, Pilates, and spinning are available. The South Seas-themed Bali Hai Golf Club is five miles away, and the 18-hole courses at Desert Pines Golf Club and Royal Links Golf Club are both within nine miles. Red Rock Canyon National Conservation Area, 23 miles away, provides rock climbing, biking and hiking trails, and scenic drives. The Lake Mead National Recreational Area, 31 miles away, offers fishing, boating, swimming, and hiking. Mount Charleston, 41.5 miles away, has biking and hiking trails, horseback riding, skiing, and snowboarding.